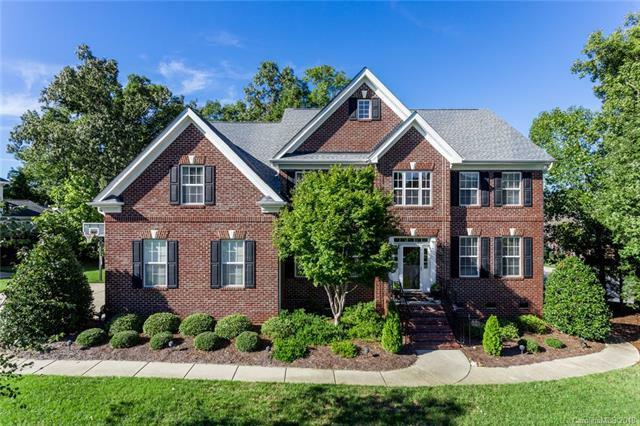 Situated in an active HOA community with golf, tennis & swimming, this beautiful home with a brand new roof has a back deck overlooking a private, wooded lot in the Union County School district! Grand 2 story foyer entrance greets flanked by sunny formal living & dining rm w/ wainscoting & thick, elegant crown molding. Back of home holds kitchen with solid surface counters, island, desk nook, double wall ovens, and stainless appliances including brand new dishwasher & microwave all overlooking the 2 story family room. Access to large back deck off breakfast nook. Guest suite on main has full bath for privacy while upstairs, 4 more beds with brand new high quality carpet, including a large master w/ sitting room & tile en suite bath. Finished attic has large bonus room-rec room, teen suite, media room - with a full bath!